Ashampoo Music Studio 2018 – Free Full Version! Ashampoo has released their free version of Music Studio and we’d like to tell you a little bit about it. As you can see in the above image Music Studio 2018 has an intuitive interface which is easy to use. It has been my experience with Ashampoo products that not only are their programs superb, but they spend time on the menu systems as well. They are well thought out. Click here to see all the products Ashampoo has to offer. Click here to read the Music Studio 2018 product information. The download link is also on this page. Enjoy your new software and let us know how you like it! Last time I tried this s/ware two weeks ago on clicking the desktop icon a window opened then quickly faded and disappeared completely and repeatedly. There was no other way to open the program. Let’s hope that it works this time. If you still have problems, let me know and I will ask my contacts at Ashampoo. Will do. Awaiting a reply re activation license requested from Ashampoo. Still no activation license or response from Ashampoo. You shouldn’t need a license for v2018. It is a free version. I must be doing something wrong then, because I’ve tried installing more than once and each time I’m taken to a page to enter a valid license. Tried “Get Activation Key” also but nothing happens. Check that the drop-down menu says something along the lines of Full Free Versions. 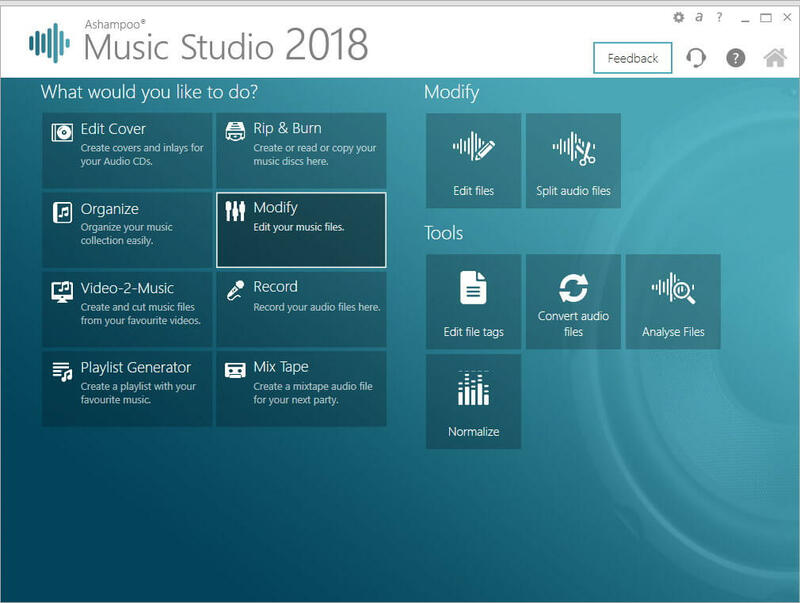 I’m seeing Music Studio 2016 not 2018. OK. Tried again downloaded but still requiring an activation key. OK, I’ll get hold of Ashampoo and ask them what to do. It is the weekend, so please be patient. Hi Richard. Appreciate your presence here and good suggestions, etc. 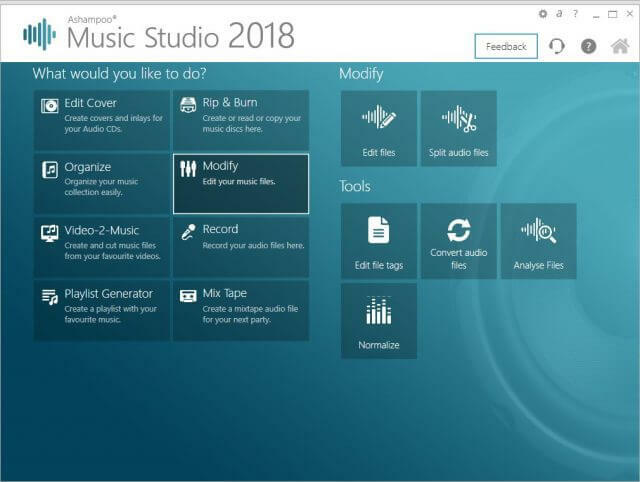 I’m wondering if you know what the difference(s) are between Music Studio 2018 and Music Studio 7 (I just bought MS7 last week at a very good price – felt a little support was in order since I’ve been using giveaways since version 3). I got curious about what the difference might be so I installed MS2018 as well. The “About” tab in MS2018 shows in brackets (7.0.1.2 (1330)), so it looks like it is version 7 in some form. The purchased version is 7.0.1.6 (1230). Features seem to be the same, but often the giveaway version has some disabled, but I’m not finding any. Don’t make it a project : ), just if you know. Sadly, Ashampoo doesn’t offer a page with version comparisons for its products. The only way I know is to look at each product’s feature list and compare them yourself. The free version should be missing something or it wouldn’t make sense for them to charge for a license. Thanks Richard for taking time to reply. Pretty generous of them either way. Perhaps it is full but won’t get updated with changes. Hard to figure what they could limit on it. Have a good day, I’m off to bed! (Canada west coast). Richard. I’ve not tried out your recent link for the free 2018 version, but I did need to register in order to get the key. Registration took some time, was frustrating at times, having to go backwards after registering an account, receiving the key and entering to allow the program to complete. Time to remind everyone, there is often nothing for free. Your time, often costs you more than purchasing the product. Companies that offer freebies often want you to become customers. This practice is used all over, from grocery stores (something like a free coupon offered by a vendor) as an example. I have not used this software yet, but intend on taking it for a spin soon, Mindblower! It’s been a slow process, but I’ve found the time to use more of the features and am very impressed. This program is a gem and for the price (free at the time), does what many other programs I’ve tried out in the past fail to include. Like with most utility programs, take the time to learn and understand. You might be pleasantly surprised with the outcome, Mindblower! Is Ashampoo music studio the same as Ashampoo burning studio? This post has been updated as of 9/26/2017. Included now is a comparison chart for Music Studio 2018 and 7. I also included step-by-step instructions to get your free copy of version 2018. Thanks for that extremely detailed comparison chart Richard. See the items I want to use should work when I get around to using Music Studio 2018, Mindblower! You are welcome… glad it helps. Thanks for getting the comparison/contrast list and posting it. Makes for appreciation of how indepth the software is. I have this and got it with a bundle from Ashampoo, i burn’t a cd from files but it did not burn all the music information. All the files had the info including the tag (MP3Tag) how can i burn all the information that is listed and not just have Track 1, Track 2, Track 3 etc etc. I posted this article over a year ago. You will have to contact Ashampoo for questions about this software. Dean, Dean, Dean. How did you burn the files? Did you select the Rip & Burn, then Create mixed format disc to burn your files, Mindblower!